It was in the summer of 1971, when Herb Cohen first saw and heard Tom Waits at the Troubadour in Los Angeles, which was one of the city’s top clubs in the city’s music scene and where many an up-and-coming singers and bands had started out before going on to greater things. Even some of the more experienced artists and bands still enjoyed playing at what was by then a legendary venue. Tom Waits who was just a twenty-two year old aspiring singer-songwriter, when he played at the Troubadour, and had already come a long way in a short space of time. Just three years previously Tom Waits was a rebellious high school student who loved R&B, country music, Bob Dylan, the Beat Generation, The Twilight Zone and The Alfred Hitchcock Hour. However, in 1968, Tom Waits dropped out of high school, and got a job Napoleon’s pizza restaurant in National City, California. During his shifts in the pizzeria, Tom Waits listened to the patrons and often scribbled down phrases and interesting pieces of dialogue which he later used in his songs. However, when Tom Waits wasn’t working in Napoleon’s, he was part of the city’s folk scene and could often be found playing in local coffee shops. Before long, Tom Waits was playing in San Diego, and as word spread about the up-and-coming local singer he was being asked to support Tim Buckley, Sonny Terry, Brownie McGhee and even one of his friends Jack Tempchin. By then, Tom Waits had come to the conclusion that he could go no further in San Diego, and would have to travel to the Troubadour Los Angeles to progress his career. That was how Tom Waits was ‘discovered’ by Herb Cohen who at the time, was managing several artists including Frank Zappa, and was a record company executive and music publisher. Despite his track record, Herb Cohen didn’t off Tom Waits the all-important recording contract, and instead, signed him to a publishing contract. Herb Cohen it seemed saw Tom Waits as a songwriter rather than a singer. Having signed a publishing contract, Tom Waits his job at Napoleon’s and moved to LA where wanted to concentrate on his songwriting career. However, in 1971 Herb Cohen had Tom Waits record the first of two demos in late summer of 1971 with producer Robert Duffey. Nothing came of these demos by the time 1971 gave way to 1972. By early 1972, Tom Waits had found and moved into a flat in Sliver Springs, which was a working class ares that was home to the Hispanic community and a number of LA’s bohemians. The area would provide Tom Waits with a wealth of material over the next weeks and months. Despite supposedly concentrating on his songwriting career, Tom Waits continued to play live and was a regular at the Troubadour which was where he first met David Geffen who had already cofounded Asylum Records. When David Geffen heard Tom Waits sing Grapefruit Moon he was “floored” and was so impressed with Tom Waits that, that night he offered the singer-songwriter a recording contract. After Tom Waits had signed with Asylum Records, David Geffen paired his latest signing with Jerry Yester, who had formerly been a member of the Lovin’ Spoonful until the group split-up in 1968. After that, Jerry Yester had embarked upon a career as a producer and would produce Tom Waits’ debut album at Sunset Sound Recorders. That album would eventually become Closing Time, which was recently remastered and reissued by the Anti-label. With the ink barely dry on the recording contract, work began on Closing Time, with Tom Waits recording a pre-production tape at Jerry Yester’s home. The pair discussed the arrangements and what instruments should be used on the album. Already, Tom Waits had an idea of the type of album he wanted to record, and made it clear that he wanted a standup bass on Closing Time. This fitted with Tom Waits’ vision of recording a jazz-tinged album for his debut. When the recording of Closing Time began in the spring of 1972, there was only one problem, and that was that Tom Waits and Jerry Yester weren’t going to be able to record late at night and into the early hours of the morning. The only time the studio at Sunset Sound Recorders was free was between 10am to 5pm. While this wasn’t exactly ideal, the pair knew that they had no option but to record during the daytime shift. By the time work began at Sunset Sound Recorders, twenty-three year old Tom Waits had already written the twelve tracks that became his debut album Closing Time. Just like many singer-songwriters he had amassed a number of songs, and some would feature on Closing Time. However, songwriting wasn’t Tom Waits’ only talent. Tom Waits who was already a talented multi-instrumentalist who played celeste, guitar, harmonium, harpsichord and piano on Closing Time. He also added his inimitable lived-in, gravelly vocal to eleven of the twelve tracks. Already, it sound as if Tom Waits, the new troubadour in town survived on a daily diet of Jack Daniels and Marlboro. It was a voice that sounded as if it had already lived several lives, and which was accompanied by some seasoned LA musicians. This included a rhythm section that featured drummer John Seiter, double bassist Bill Plummer and guitarists Shep Cook who added backing vocals and Peter Klimes who played pedal steel on Rosie. They were joined by trumpeter Delbert Bennett Meanwhile, Jerry Yester took charge of production and guided the debutant singer through the maze that is recording a debut album. For the first couple of days of the session at Sunset Sound Recorders, Tom Waits spent time finding his way around the studio, but after that, his nerves disappeared. So much so, that he was confident enough to voice his concerns at the direction of his debut album. Producer Jerry Yester was intent on making Closing Time a folk based album, which wasn’t what Tom Waits wanted. He envisaged Closing Time as a jazz-tinged, which was what he wanted to make. Despite this difference of opinion, Tom Waits and Jerry Yester worked well together, and the singer soon grew in confidence and was directing his band. So much so, that when Ol’ 55 was recorded, drummer John Seiter was directed to add backing vocals and added a perfect harmony line before the chorus kicked in. It looked as if the recording going to plan. Alas, at the end of the first recording session, nine songs had been recorded, but Tom Waits was disappointed with several songs, and Jerry Yester booked another session. This time, it took place at Western Union Recorders in Hollywood. Joining Tom Waits bands the following Sunday was a trio of guest artists that included bassist Arni Egilsson and trumpeter Tony Terran who featured on the instrumental version of Closing Time, while cellist Jesse Ehrlich played on Martha. That day, only one song was rerecorded, Closing Time, while trumpets and strings were overdubbed. After ten days Tom Waits had recorded his debut album Closing Time. With Closing Time completed, the album was mixed and mastered at Wally Heider Studios, in San Francisco. Now Tom Waits was ready to release his debut album. Given David Geffen was keen to send Tom Waits into the studio to record Closing Time in the spring of 1972, the troubadour must have thought that the release of his debut album was imminent. Sadly, that wasn’t the case and it was nearly a year before Closing Time was released by Asylum Records. Eventually, the release of Closing Time was scheduled for March the ‘6th’ 1972, which was almost a year after the album had been completed. It had been a long wait, and Tom Waits hoped that the critics and then record buyers would enjoy and embrace his debut album Closing Time. Critics on hearing Closing Time discovered what was an eclectic album, that featured a variety of musical genres. There was everything from jazz, folk and blues to country-rock which was embraced by Rolling Stone magazine and the self-styled dean of rock critics Robert Christgau. Some critics even drew comparisons with Randy Newman which was high praise indeed. However, it was richly deserved. Closing Time opens with Ol’ 55, a classic-in-waiting about escapism where a jangling piano sets the scene for Tom Waits’ lived-in vocal. His delivery of the cinematic lyrics is emotive on this anthemic track. There’s a wistfulness to I Hope That I Don’t Fall In Love With You which features a contrarian Tom Waits, while Virginia Avenue which is the first of the jazz-tinged tracks. Old Shoes (and Picture Postcards) has a much more understated arrangement with guitar and backing vocals accompanying Tom Waits on this singalong song. It gives way to the jazzy Midnight Lullaby, has a smoky late-night sound, while a piano and strings accompany a vulnerable Tom Waits on the beautiful ballad Martha. A weeping pedal steel and backing vocals accompany Tom Waits on Rosie, as he delivers a soul-baring vocal on this country-tinged piano led song. Lonely featured a melancholy, emotive vocal before the tempo rises on Ice Cream Man. It’s very different from the rest of album and this uptempo track shows another side of troubadour Tom Waits. The bluesy, jazz-tinged Little Trip To Heaven (On The Wings Of Your Love) is much more representative of Closing Time as a trumpet accompanies Tom Waits and his piano on another beautiful song. It gives way to the jazz-tinged Grapefruit Moon, before the melancholy and evocative instrumental version of Closing Time is rich in imagery and closes this impressive debut album on a high. 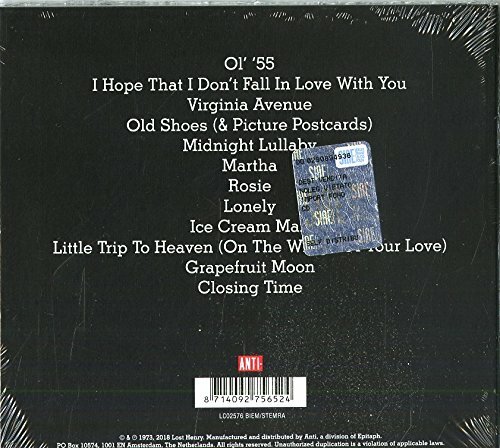 Despite the quality of Closing Time, the album failed to trouble the US Billboard 200, but was certified gold in Britain and reached twenty-nine in the Republic of Ireland. However, later, record buyers rediscovered Closing Time, and for many years it’s had a cult following. They’ve been won over by a Tom Waits jazz-tinged, bluesy debut album that occasionally heads in the direction of folk music as LA’s newest troubadour announces his arrival. Closing Time was a remarkably mature album, as Tom Waits was only twenty-two when he recorded the album with Jerry Yester. However, with his lived-in, worldweary voice he sounds much older, and is if he’s lived several lives, and the lyrics on Closing Time. Despite displaying maturity beyond his years on this carefully crafted album, there’s also a sense of loneliness, melancholy and vulnerability as the lovelorn Tom Waits wears his heart on his sleeve on Closing Time. It’s also an album that is sardonic and fully of irony as a drawling Tom Waits sometimes resorts to sneering, which comes across a defence mechanism. Other times, Closing Time has a late-night smoky sound. Especially on the jazz-tinged tracks on Closing Time, which are among the album’s highlights. 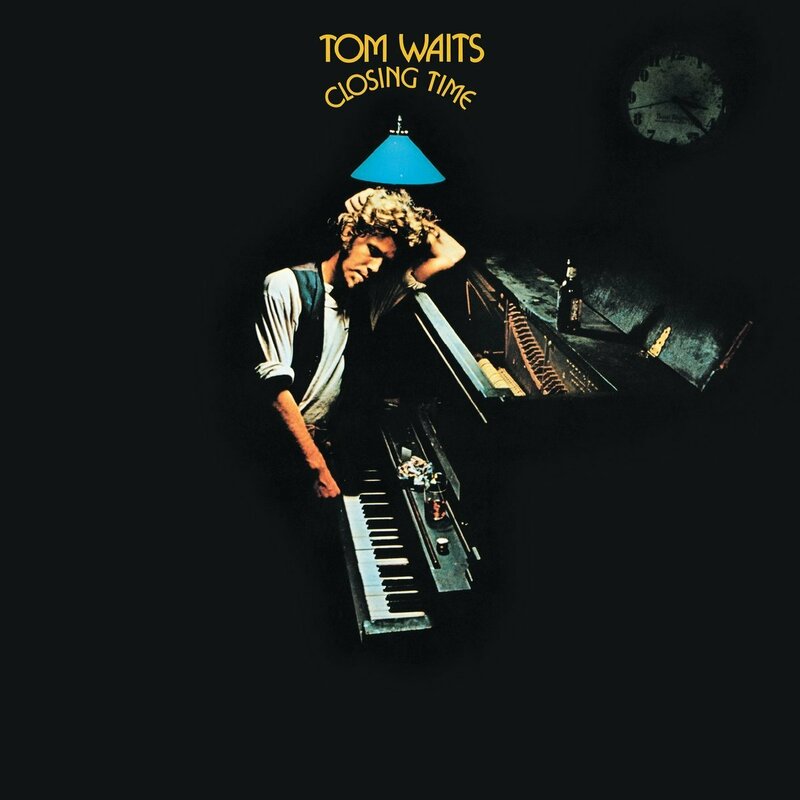 Closing Time is also a melodic album full of emotion and sometimes beauty, as Tom Waits plays a variety of characters and brings their story to life. This he would do throughout his long and illustrious career, but one of the finest albums of Tom Waits’ career was his debut album Closing Time, which is the perfect way to discover this truly talented troubadour. ← LED ZEPPELIN-HOW THE WEST WAS WON.